I don’t think I can adequately describe my love of crepes, so you’ll just have to believe me when I say that upon reading PoP’s breaking of not one but two crepe cafes hitting my ‘hood this winter I just about passed out from sheer bliss. Three words, people – Nutella! Banana! Strawberry! That’s all it takes to get me in a buckwheat batter lather!! 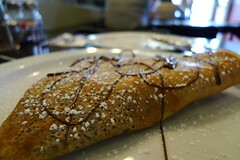 Anyway, yes, two creperies will open on the rapidly blooming 14th Street Corridor this season. Crepes on the Corner in the old Garden District space at 14th & S (by the same owners as the garden shop) and Point Chaud in the storefront formerly operated by Circle Boutique (on roughly the opposite side of the street). The former has the opportunity for a large outside seating area so I predict quite a hot brunch spot. The latter will probably be cosier. But who cares about the details! Nutella! Banana! Strawberry! Two, two creperies. So close to me. I’m in heaven. Dancing around with dreams of savory and sweet. Can’t wait.